In 1947, with the end of the British regime, India was constituted as a sovereign, socialist, secular, democratic republic. Through the formative years of independent India, societal consciousness developed in relation to the nature of the country's economic fabric.2 Socioeconomic welfare thus came to be of paramount importance for the Indian legislature and, accordingly, several laws were enacted in the period around Indian independence.3 A chief factor in the labour-related legislative reforms was the realisation that the British rulers had intervened in labour matters merely to protect their individual or collective commercial interests.4 The reforms sought to safeguard workers' interests, especially in the inflationary aftermath of the Second World War. A climate of unemployment, and the burgeoning trade union movement5 propelled state intervention in favour of the labourers.6 Against this backdrop, the Industrial Disputes Act 1947 (the ID Act) was enacted to provide for investigation and settlement of industrial disputes.7 Under the ID Act, 'workmen' are empowered to use its mechanisms effectively against the oppressive tactics of employers. They can take a host of labour issues ranging from payment of minimum wages and social security benefits to unfair labour practices such as arbitrary dismissal, discharge and retrenchment to the industrial tribunals and labour courts set up under the ID Act. The ID Act thus forms the primary legislation in India that seeks to preserve harmonious industrial relations between employers and employees. The ID Act and most other labour statutes in India do not apply uniformly to all establishments or levels of employees. Typically, the applicability of each statute has to be assessed at two levels: (1) to an establishment as a whole; and (2) to all employees or a specific section of employees. The first level of assessment needs to be through the definitional clauses of each statute. All labour law statutes contain separate definitions of 'establishment', 'factory', 'industry', 'employer', 'mine', 'plant', among others. To qualify under the statute, these definitions typically require the establishment to carry on some systematic activity, have a certain strength of workforce, be a shop or a specific type of establishment. In respect of the second assessment, various central and state laws categorise employees according to their wages, their role within the organisation, length of service, among others. The applicability of labour legislation to a specific employee depends on the category of that employee. For example, the ID Act is applicable only to employees at the level of 'workman' and thus, whether or not an employee is a workman under the ID Act becomes a very important determination. any person (including an apprentice) employed in any industry to do any manual, unskilled, skilled, technical, operational, clerical or supervisory work for hire or reward, whether the terms of employment be express or implied . . . but does not include, inter alia, any such person who is employed mainly in a 'managerial or administrative capacity'; or who, being employed in a 'supervisory capacity', draws wages exceeding 10,000 Indian rupees per month. Further, Section 2(k) of the ID Act requires that industrial disputes are limited to those disputes or differences between employers and workmen, between workmen and workmen, or between employers and employers that are connected with the employment or non-employment or the terms of employment or with the conditions of labour of any person. Typically, Section 2(k) requires the involvement of workmen or members of the union to raise an industrial dispute. However, under Section 2A, the ID Act provides leeway to an individual workman to raise an industrial dispute, provided that the dispute connects with or arises out of a discharge, dismissal, retrenchment or termination. Several courts have settled that an individual dispute does not require the espousal or backing of other workmen or any union, provided that its subject matter pertains to the specific types of disputes under Section 2A. The ID Act focuses on regulating industrial relations, but there are several other labour law statutes that also provide for dispute resolution mechanisms or the appointment of authorities to adjudicate claims under the statute concerned.8 For example, the Minimum Wages Act 1948 provides that the appropriate government may appoint an officer at the level of regional labour commissioner or assistant labour commissioner to decide claims arising out of deductions from wages or delays in payment of wages. Similarly, the Employees' Provident Fund and Miscellaneous Provisions Act 1952 (the EPF Act) provides for the appointment of authorised officers such as the central provident fund commissioner and the regional provident fund commissioner to decide disputes relating to the application of the EPF Act, determination of the amounts due from an employer, inter alia. The EPF Act also provides for the constitution of the Employees' Provident Funds Appellate Tribunal as an appellate forum. Despite the existence of similar adjudicatory bodies under other labour statutes, a significant amount of labour litigation is actively pursued before the industrial tribunals and labour courts set up under the ID Act. This is because labour issues predominantly relate to issues such as undue discharge or dismissal, non-observance of exit procedures, employee entitlements to retrenchment compensation, oppositions to disciplinary action taken against misconduct or sexual harassment, disputes over whether an employee is a workman or not, whether the individual is an 'employee' or not, and non-payment of social security benefits. As to the general tenor of employment litigation in India, courts prefer to maximise employees' interests in labour disputes while balancing employers' interests. Courts and tribunals generally seek to secure for employees a degree of basic sustenance or livelihood, protect them against exploitation by employers and equalise the relative bargaining capacities of employers and employees. In this context, courts may appear inclined towards protecting employees' interests. 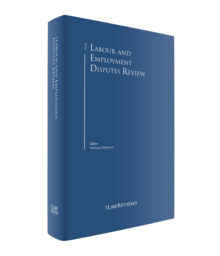 This tendency arises from the socioeconomic context of several labour law enactments, and the disparity in the relative bargaining capacities of employers and employees. For example, in cases relating to procedural impropriety during dismissal, unfair termination, etc., it is often noticed that industrial tribunals or labour courts do not hesitate to take an employee-friendly view. In several cases, tribunals or courts have ordered reinstatement with full or part back pay for the employee's period of unemployment. reception of evidence taken on affidavit. The ID Act requires the parties to an industrial dispute to apply to the appropriate government to refer the matter for adjudication. If the appropriate government is satisfied that an industrial dispute has occurred or is apprehended, it may refer the dispute to a board of conciliation, to a court of inquiry, to a labour court (provided the dispute relates to a matter specified in Schedule II to the ID Act) or to an industrial tribunal (provided the dispute relates to a matter specified in Schedule II or Schedule III to the ID Act). When the dispute is before the conciliation officers,10 each party to the dispute can lay out his or her demands or requirements separately before the conciliation officer and jointly with the opposite parties. Using this mechanism, the parties or their representatives in the unions can seek to collectively bargain and resolve the differences between them. In fact, it is the duty of the conciliation officer to investigate or resolve the matter amicably, and induce the parties to come to a fair settlement. Where the conciliation proceeding succeeds, the conciliation officer is required to submit notice of this to the government concerned, with his or her report11 and a memorandum of settlement. Where the conciliation fails, the officer is required to submit to the government a detailed report on the steps undertaken to resolve the dispute, and to give his or her opinion of why the settlement could not be achieved. Where the conciliation fails and a report is submitted, the government concerned is required to satisfy itself of a need to make the order of reference to either a labour court or an industrial tribunal. Where an industrial dispute is referred to either of these forums, it is required to complete its proceedings expeditiously, within the time prescribed in the order of reference,12 and submit its award to the government. The government is required to publish the forum's report within 30 days of its receipt. Published awards of labour courts or industrial tribunals will be deemed final and binding on the parties to the dispute. Despite the finality of the award, a writ can be filed before the High Court under Article 226 of the ID Act if the award suffers from patent perversity or grossly flouts the basic principles of natural justice. The above-listed dispute resolution procedures under the ID Act are not applicable to non-workman-level employees. Their terms of employment are guided by the relevant state-specific shops and commercial establishments acts13 (the S&E Acts), provided they qualify as employees under the S&E Acts. Further, the S&E Acts typically require employers to have a reasonable cause for terminating an employee's employment and to give at least one to two months' notice prior to termination (based on the length of the employee's service) or to make payments in lieu of the notice period. Thus, under the S&E Acts, employees can file complaints with the inspectors (who are appointed under the Acts) against their employers for depriving them of their statutory entitlements or for violating the provisions of the S&E Acts. The disputes of such employees that progress to the civil or higher courts commonly relate to non-observance of the exit procedures prescribed under these pieces of legislation. Generally, the procedures under the CPC would apply to employees taking this route for dispute resolution. Similarly, employees such as supervisors, managers and other senior-level employees can have recourse to the civil courts to address their employment-related disputes; typically, disputes by these employees would involve breach-of-contract claims based on contractual rights and obligations or conditions of service. Industrial tribunals and labour courts in India adjudicate on a plethora of employment-related disputes, ranging from issues such as redundancies, disciplinary action because of misconduct or allegations of sexual harassment, procedural impropriety in conducting disciplinary enquiries, non-payment of exit payments and performance-based terminations to regularisation claims in the context of contract labour. In all these cases, courts stringently require employers to observe statutory procedures before taking any penalising action or discharging the employee from his or her position. Further, Indian courts do not recognise 'at-will' terminations, and typically require that termination of employment should be for a 'reasonable cause' (which must be mentioned in the termination notice). For example, unilateral terminations or redundancies for genuine business reasons would be considered as terminations based on a reasonable cause, as would terminations based on poor performance. However, even terminations based on a reasonable cause should be attended by statute-prescribed procedures or judicially evolved principles for termination. We have briefly set out below the procedures that result in disputes that are frequently seen before the adjudicatory bodies. In the event of a retrenchment (including a redundancy), the ID Act requires employers to notify both the government authorities and the workmen that they intend should be retrenched, follow the 'last in first out'14 rule, and publish a seniority list of the workmen. Further, upon termination, employers are required to make certain statutory payments, such as accrued but unpaid wages (until the termination date), notice pay (if applicable), retrenchment compensation,15 wages in lieu of accrued privilege leave that has not been taken, any contractual dues and gratuities (if payable). Thus, disputes in this respect typically arise when employers fail to follow the mandatory processes or make the requisite payments. Terminations based on poor performance are referred to as 'termination simpliciter' and those based on misconduct are known as 'stigmatic terminations'; each type is treated differently by the courts. Although there is no statutory process for terminating employment on the ground of poor performance, courts generally require employers to provide the underperforming employee with a 'reasonable opportunity' to improve. This typically includes providing them with targets or goals to achieve, offering assistance or the support needed to improve their performance, and monitoring their performance for a specified period. Despite this, if the employee's performance does not improve, then companies may proceed with termination. Even here, employers are required to ensure that the termination letter is not stigmatic in nature and that severance payments are made. This is because courts view poor performance not as a 'fault' of the employee, but as a mismatch between the skills or competence of the employee and the expectations of the employer. In cases of misconduct, issues mostly relate to the quantum of punishment or the failure to adequately hear the parties. Courts require that the punishment is proportionate to the offence. Further, if an employee is to be dismissed, courts require that before any action is taken, the employee is given a fair hearing to respond to the charges levelled against him or her, in accordance with the basic principles of natural justice. The fair-hearing requirement includes issuing a charge sheet, appointing an enquiry officer and conducting an enquiry. In both the above situations, if courts find that due process was not followed, they may order the reinstatement of the employee with or without back pay. Although sexual harassment in the workplace constitutes misconduct, the Sexual Harassment of Women at Workplace (Prevention, Prohibition and Redressal) Act, 2013 (the SH Act) requires employers to address such complaints through a committee process. Under the SH Act, all establishments with 10 or more employees are required to constitute an internal committee (IC), comprising a presiding officer, two employee members and one external member from a non-government organisation or association (the NGO member). The law also prescribes specific qualifications for each member of the IC. Challenges raised under the SH Act commonly pertain to improper constitution of the IC, and the IC's failure to follow due process during inquiries. When the challenge is successful, courts often direct the company to conduct a fresh inquiry and, in some cases, order payment of compensation. There have been no significant legislative developments in India (under the ID Act, the S&E Acts or the SH Act) that affect the way in which the judiciary resolves employment disputes. Having said that, in recent months, courts have reaffirmed their commitment to balance employer and employee interests. Under the Payment of Gratuity Act, 1972 (the PG Act), employees with five years of continuous service are entitled to receive a gratuity (a long-service payment) at the time of their exit. However, employers can wholly or partially withhold a gratuity, in limited circumstances, if the services are terminated for reasons such as the employee's riotous or disorderly conduct, or if the employee's acts (during the course of employment) constitute an offence of 'moral turpitude'. The Supreme Court recently confirmed the additional procedure employers need to follow before forfeiting gratuity on account of moral turpitude. In this case,16 disciplinary proceedings were initiated against an employee for his failure to discharge his duties, and for committing certain acts that were 'unbecoming of a bank officer'. The employer-bank partially forfeited the employee's gratuity, reasoning that his misconduct constituted an act of moral turpitude. Since the High Court ruled that, under the PG Act, gratuity could be forfeited for misconduct only if it caused financial loss to the employer, the employer-bank raised an appeal before the Supreme Court. Dismissing the employer-bank's appeal, the Supreme Court clarified that misconduct (established during the disciplinary inquiry) was an insufficient ground to forfeit gratuity for 'an offence of moral turpitude'. The rationale here was that only a court of competent jurisdiction could convict an individual for an offence involving moral turpitude. As the employer-bank had not even set the criminal law machinery in motion to establish that the employee had committed an offence of moral turpitude, it could not forfeit gratuity; thus, forfeiture of gratuity would not be automatic on dismissal from service, and would depend on whether the employee's act or omission were punishable under law. Previously too, the Supreme Court and some High Courts have endorsed the view17 that misconduct proved through a disciplinary proceeding cannot be construed as a punishable offence under law. Despite this, a few High Courts took a contrary view on the ground that the standards of proof for establishing guilt under a criminal proceeding and under a company's disciplinary inquiry vary. With the Supreme Court's latest ruling on this issue (in the employer-bank case), it is now clear that unless an employee has been convicted by a court of law, employers would not have the ability to forfeit gratuity on account of moral turpitude. While this is the current legal position, imposing a conviction as a precondition to forfeiture can prove to be rather onerous for employers, as the expenses incurred for the litigation process may itself far exceed the gratuity intended to be forfeited. Further, in cases of grave misconduct (such as sexual harassment), the complainant may prefer not to file a criminal complaint against the accused employee. In such cases, employers could face practical difficulties in forfeiting the accused's gratuity. If an employer has not constituted an IC (on account of not having 10 employees), then victims of sexual harassment can file their complaints with a local committee (LC), which is an inquiry body constituted by the government. The requirement under the SH Act is that both an IC and an LC should include an NGO member who is 'committed to the cause of women or a person familiar with the issues relating to sexual harassment'. The rules under the SH Act provide that in relation to the LC, a person would be considered as being familiar with 'issues relating to sexual harassment' if he or she is a social worker with experience of the empowerment of women or is a person familiar with labour, service, civil and criminal law. In this case,18 the appellant-victim challenged the IC's constitution on the basis that the NGO member did not have the qualifications required for IC membership. The respondent-employer contended that it had properly constituted the IC on the basis that the NGO member was a labour law practitioner. Rejecting this argument, Delhi High Court held that although the NGO member was a labour lawyer, no evidence was given to demonstrate that he was experienced in dealing with sexual harassment cases, or in representing the cause of women. The Court further clarified that the provision for appointing labour lawyers applied only with respect to an LC's NGO member, and the same qualifications or attributes could not be applied while assessing the eligibility of an IC's NGO member. On this basis, the Court struck down the respondent-employer's IC proceedings, and ordered the reconstitution of an IC and fresh consideration of the matter. This case highlights the importance of evaluating each individual's eligibility to be appointed as a committee member, and the caution that employers are required to exercise prior to appointing them. All litigation in India is typically a drawn-out, expensive process, owing to factors such as procedural lags, backlogs and non-appearance of parties. Traditionally, most labour litigation pertains to the disputes of unions and the labour masses, because of the general misconception that the term 'workman' under the ID Act relates to employees in blue-collar jobs. Given the increased awareness among the educated classes, especially in the information technology (IT) sector, of their rights under the ID Act, the S&E Acts and the SH Act, individual labour disputes have been on the rise. The Forum of Information Technology Employees and the Karnataka State IT Union have very recently taken the initiative to form IT trade unions in the Indian states of Tamil Nadu and Karnataka. This emerging IT trade unionism movement should further catalyse the pursuit of labour disputes by white-collar employees. Further, the involvement of unions is likely to strengthen the collective bargaining powers of IT employees against unfair retrenchment. While no immediate legislative changes may follow in the field of dispute resolution, one would not be wrong in expecting to see more challenges to unfair redundancies in the IT sector if employers do not adhere to due process under labour statutes. Further, with the reignition of the #MeToo movement in India, there has been a considerable spike in the number of sexual harassment complaints filed with ICs, specifically time-barred and anonymous complaints. Given the various nuances inherent to such complaints, it is likely that litigation will multiply if employers do not handle them in accordance with the law. 1 Ajay Raghavan and Swarnima are partners, and Amulya Chinmaye is an associate at Trilegal. 2 Report of the National Commission on Labour, Ministry of Labour and Employment and Rehabilitation, Government of India, 1969. 3 Constituted as a federal republic, India has legislative branches at both central government and state government level. Further, under the Constitution of India, 'labour' is classified as a subject on which both the central and state governments are empowered to legislate. Most state legislatures have either enacted amendments to central legislation on this particular subject, or created their own rules for implementation. Further, several state governments have enacted independent statutes resulting in diverse state legislation on labour matters. 5 Kennedy, Van D, 'The Sources and Evolution of Indian Labour Relations Policy', Indian Journal of Industrial Relations, at pp. 15 to 40, Vol. 1, No. 1 (1965) (available at www.jstor.org/stable/27760575) (last accessed on 2 January 2018). 6 Several giant trade unions, such as the Indian National Trade Union Congress, the Hind Mazdoor Sabha and the United Trade Union Congress, were formed in this era. (Nitin Sehgal, 'Brief History of Trade Union Movement in India', Important India, 21 November 2013, www.importantindia.com/8419/brief-history-of- trade-union-movement-in-india/). 7 Statement of Objects and Reasons, Industrial Disputes Act, 1947. 8 Labour laws in India are divided into more than 200 statutes governing subjects ranging from conditions of employment to social security, health, safety, welfare, etc. 9 This is because the Industrial Disputes Act 1947 (the ID Act) was conceptualised to provide a mechanism to settle disputes between an employer and its employees, or a substantial section of the employees. The object of the ID Act is to maintain industrial peace and achieve collective amity by preventing industrial strikes or lockouts. It is not intended for the ID Act to take the place of an ordinary tribunal of the land for enforcing the contracts between an employer and an individual workman. Thus, the application of the ID Act to an individual dispute is excluded unless it acquires the general characteristics of an industrial dispute (i.e., espousal or backing of the workmen as a body to make common cause with the individual workman) (PM Murugappa Mudaliar Rathina Mudaliar & Sons v. Raju Mudaliar (P) and Ors (1965) 1 Kant LJ 489). Hence, it is determined that if an individual raises a dispute, it can only be for a removal, termination or dismissal. If the workman wants to raise a dispute relating to other claims, it can only be done by the union on behalf of the workmen or workman (Prakash and Ors. v. Superintending Engineer (Eel) (2001) 1 Kant LJ 490). 10 The ID Act requires the appropriate government to make an order of reference to the relevant board of conciliation. However, practically, either party can directly request in writing that a conciliation officer commence the conciliatory process. 11 To be submitted within 14 days of the commencement of the conciliation proceedings. 12 However, when the industrial dispute referred is in the nature of an individual dispute under the ID Act, the period for submission of the award must not exceed three months. 13 The state-specific shops and commercial establishments acts are the primary legislation governing several aspects of the employer–employee relationship, such as working conditions of employees across the state, termination of employment, work timings, leave entitlement, resolution of disputes and other rights. 14 The last in first out rule, inter alia, requires employers desirous of retrenching workmen to first terminate the workman who was the most recently employed in a particular category in the establishment and is a citizen of India. 15 Upon termination, the ID Act requires employers to pay employees retrenchment compensation (calculable according to the method laid down under the ID Act). 16 C.A. No. 8251/2018 (S.L.P. (Civil) No. 3852/2017). 17 Jaswant Singh Gill v. Bharat Coking Coal Limited and Ors (2007)1 SCC 663. 18 (2017) 2 SCC 308.